Help & DocumentationCreating ContentCreating Basic Metrics and Reports Choosing between Metrics, Multi-Metrics, and ReportsWhat is the Impact of Charting Intervals on Charts? What is the Impact of Charting Intervals on Charts? 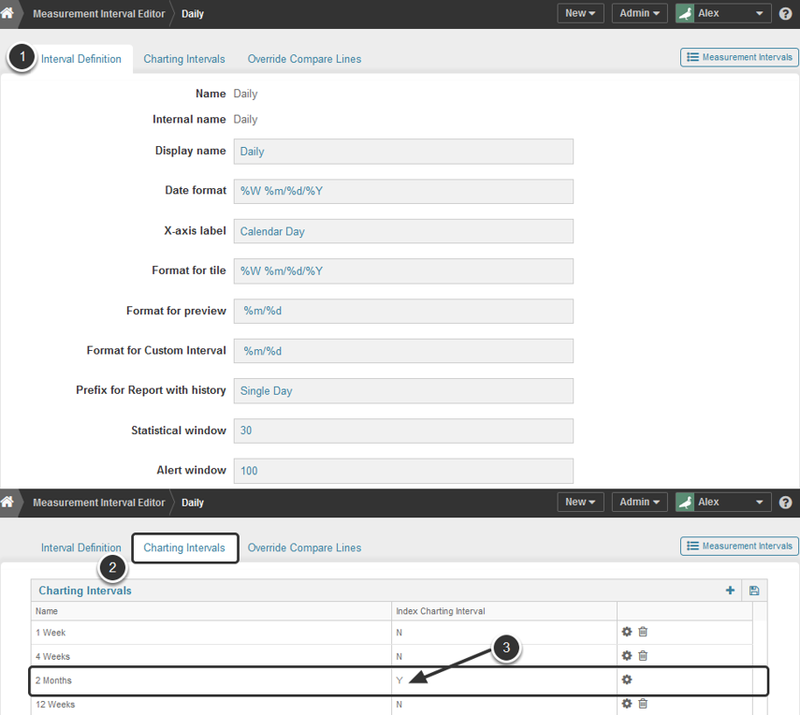 The setting for Index Charting Interval on the Measurement Interval Editor is established when a Charting Interval is added to a Measurement Interval. This setting is used to govern the generation of the thumbnail shown on the tile and the Chart Preview images, and it is also the Charting Interval that opens up when you access the element in the Viewer. Only one Charting Interval is 'indexed' for each Measurement Interval. This setting impacts Metric and Multi-Metric Charts. The example below is for a Metric. See that the default value in the Charting Interval buttons is '2m' ('2 Months'). Prev: What options are available for manually loading metric and report data? Next: Why are there Compare Lines only on some Metric Charts?